Four-star chef David Bouley's first cookbook, "East of Paris: The New Cuisines of Austria and The Danube," introduces American home cooks to "new" Austrian cuisine. Austrian cuisine is influenced by the countries it is surrounded by: Switzerland, Germany, Italy, Slovenia, Hungary, and the Czech Republic. These neighboring countries added their culinary traditions to the melting pot of Austrian cuisine, but they were not the only ones Bouley writes in his book. "Other influences include Turkish, Alsatian, French, Spanish, Dutch, Bohemian-Moravian, Polish, Croatian, Serbian, and Jewish cuisines." The book is divided into recipes for the four seasons, signature dishes, and traditional sweets. Notes from the Kitchen The apple-rosemary puree is a hidden jewel in this recipe. It has incredible flavor from heating the fresh rosemary sprigs in brown butter before adding the apples. No matter how many times we make it, we never get tired of the moment when the rosemary hits the butter in the pan and releases its scent; it smells so good, you just have to stop for a second and breathe it in. The recipe makes plenty, and the leftovers are divine. Prepare the apple-rosemary puree: Wrap the cinnamon stick and clove in a piece of cheesecloth and tie it with kitchen string. Place it in a large saucepan along with the apples, wine, and sugar, and stir. Cover and cook over medium heat for 10 minutes. Remove the cover and cook, stirring frequently, until the liquid has been absorbed and the apples are very soft, about 30 minutes. Meanwhile, melt the butter in a small saucepan over medium heat. Let it cook until the white milk solids fall to the bottom and turn nut-brown, about 5 minutes. Add the rosemary and shake the pan so that the butter foams up around it. Remove from the heat and let steep for at least 5 minutes. To prepare the salmon, preheat the oven to 250F. Season both sides of the salmon fillets with salt and pepper. Spread 1/2 tablespoon of the softened butter over each of two large ovenproof plates. Lay 4 fillets on each plate, and top the fillets with the remaining 1 tablespoon butter. Wrap the plates in plastic wrap to form a tight seal. Place them on the middle rack in the oven a cook for 10 minutes. The fish will still look raw but it will have taken on a silky, firm texture and will be heated through. While the salmon is cooking, reheat the Wurzelgemuse: Melt the 1 tablespoon butter in a saucepan over moderate heat. Add the vegetables, tossing to coat them in the butter. Cook until they are heated through, about 4 minutes. Season to taste with salt and pepper. Season the chive oil with 1/4 teaspoon salt and the lemon juice. Gently reheat the apple puree. To serve, put 1 tablespoon of the apple puree in the center of each plate. Arrange 2 salmon fillets over the puree, and top with 1/4 cup of the Wurzelgemuse. 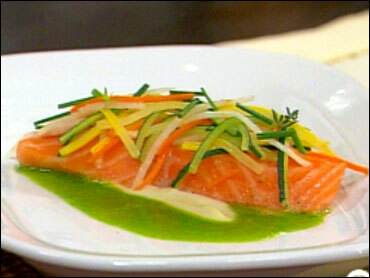 Spoon the chive oil around the salmon, and grate a dusting of fresh horseradish over all. Notes From the Kitchen The Danube has two sous-chefs named Thomas, both from Austria. So for ease, we call them T1 and T2. T1 is Thomas Mayr; T2 is Thomas Kahl. This dish is T1's brainstorm. He experimented with many different kinds of winter squash to find something dense and sturdy but still sweet and delicate in flavor. Buttercup was the best, but a combination of red kuri or kabocha and butternut was also great. You can use any one of them, though. Poaching the shrimp in oil, a classic technique, cooks them through without making them rubbery. Prepare the dressing: Place the egg yolk, shallot, sherry vinegar, garlic, sugar, and mustard in a food processor, and pulse to combine. With the motor running, gradually drizzle in the olive oil, and then the vegetable stock, until the mixture is smoothly combined and as thick as honey. Season with salt and pepper. Transfer the dressing to a bowl and fold in all the remaining ingredients, whisking in the sour cream last. Cover and refrigerate until ready to use. To prepare the sweet and sour squash, place the coriander in a large heavy skillet over medium hear. Toast, stirring, until fragrant, 1 to 2 minutes. Transfer the seeds to a plate to stop the cooking, and wipe out the pan. Sprinkle the sugar in the pan in an even layer. Heat without stirring until it melts and turns into a medium-dark amber caramel (swirl the pan if it colors unevenly), 6 minutes. Pour the orange juice and the Champagne vinegar (stand back-it will spatter), and cook slowly, stirring, until the caramel dissolves. Add the grated squash, ginger juice, toasted coriander seeds, salt, and pepper to the pan and cook over medium heat, stirring occasionally, for 10 minutes. Add the grated apple and continue to cook until the apple and squash are just barely tender, about 10 minutes longer. Stir in the honey as needed to achieve a sweet-sour effect. Keep warm. Cook the shrimp: Place the oil, garlic, thyme, and rosemary in a 2-quart saucepan over medium heat. Place a thermometer in the oil, add the shrimp, and slowly hear until the oil reaches 150F. Remove the pan from the heat and let the shrimp cook until just the tails begin to curl and the flesh feels firm, about 10 minutes. Use a slotted spoon to transfer the shrimp to a paper towel-lined plate, and season with salt and pepper. Strain the pumpkin seed dressing through a fine-mesh sieve into a bowl, and dip the shrimp in the dressing to coat each one. To serve, make a small bed of the sweet and sour squash on each plate and arrange the shrimp on top. Note: To make ginger juice without a juicer, grate peeled fresh ginger into a fine-mesh sieve set over a bowl (or use a piece of cheesecloth). Press down on the ginger (or squeeze the cheesecloth) to extract all the juice.